Often, they want to know more about world events and breaking news. Twitter has emerged as a vital source of this real-time information, with more than 100 million users sending 250 million Tweets every day on virtually every topic. As we’ve seen time and time again,news breaks first on Twitter; as a result, Twitter accounts and Tweets are often the most relevant results. On Twitter: 7 would give up Google; 6 would give up Twitter; 1 said it was a false choice; 1 said it was a stupid question. On Tumblr: 1 would give up Google; 13 would give up Twitter; 1 said MySpace. I would give up Google. Without blinking. I can always ask someone on Twitter to look something up for me. It’s like asking if I’d rather talk to someone on the phone or deal with an (granted, very sophisticated) automated message menu. I’d give up Twitter, if only for Gmail and Gcal. They pretty much run my life. Twitter. In a heartbeat. Google has too many different, valuable services. Twitter is just 140 characters and maybe a link. Google; I’m sure I could find another search engine, if need be. There’s nothing that replicates Twitter for me. 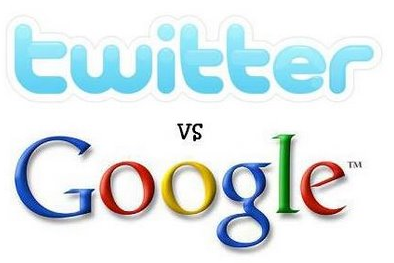 Google, because whereas not as good, there are other search engines and not really another twitter. Twitter. In a New York minute. I could ask Twitter all the things I’d ask Google, and probably come up with just as good if not better answers! So what say you? Which would you give up? There is no doubt that Twitter is now making an enormous impact on the political and social world. However, if Twitter did not exist, people wanting to spread new and views quickly would still have many other channels. On the other hand, we need Google to ensure that we can search and find any news, views and any other information published in any online format. Yes, there are other search engines but yes also there are many alternative ways to get your message out without Twitter.